Want to help Long Beach residents find local food? 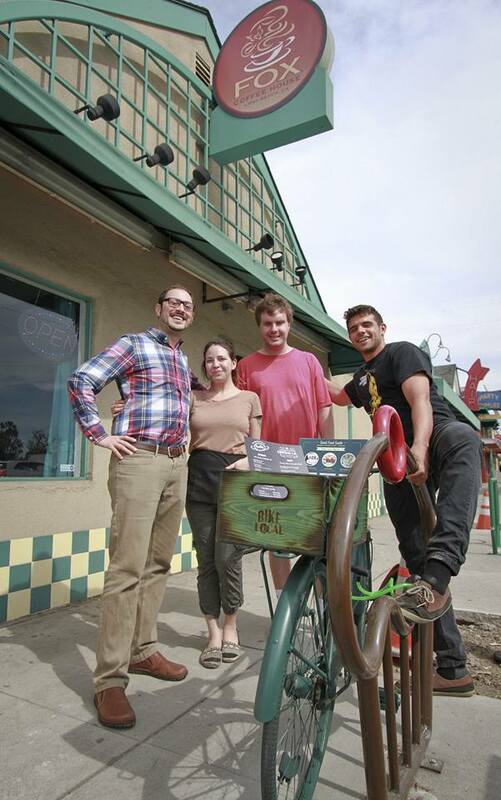 Our Local Food Spot Bikes are vintage rescued bikes, intended to spread the good food news at your local hot spot! Local businesses, business districts, and organizations can participate by claiming one of our custom-made bikes to place outside your spot. We’ll bring the bike and lock, outfitted with a local food resource basket – designed and hand-made by Bike Local – stocked with our neighborhood good food guides, maps, and helpful tips to eat better in the neighborhood. Local bike spots need to wheel out the bike at the open of business, lock it near their business, and bring it in at the end of the day. Bike spots are encouraged to promote the resource to their patrons – some, like our initial bike at Fox Coffeehouse in the Wrigley Neighborhood, have even become sharing points for neighborhood-grown veggies and herbs! In this case, it’s the business’ role to make sure any produce being shared remains fresh and safe – but in our experience, shared produce goes fast! Contact us today to see if your local spot is a good fit!